Senator Stedman speaks at the christening of the F/V Arctic Prowler. Photo courtesy of Rosie Roppel. 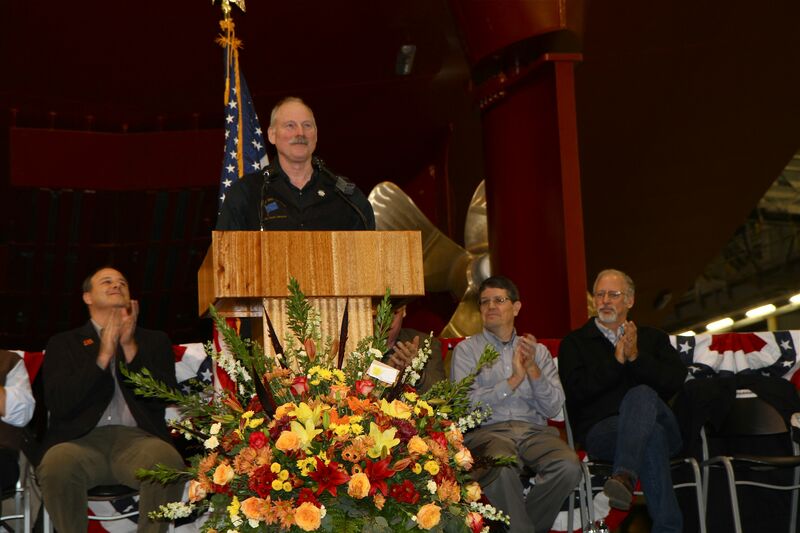 Last Saturday, I was in Ketchikan for the christening ceremony of the F/V Arctic Prowler, a 136 ft. freezer longliner commissioned by the late John Winther. 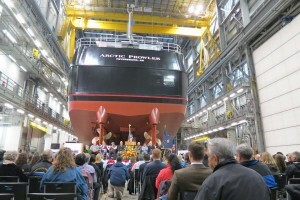 Besides being the first vessel constructed in Ketchikan Shipyard’s new 70,000 sq. ft. assembly and production hall, it is also the largest commercial fishing vessel ever built in Alaska. John was a good friend of mine and I was proud to participate in the christening of such an impressive vessel in his honor. John was born in Fairbanks on November 12, 1944 and he spent much of his childhood in Juneau before returning with his family to Fairbanks where he graduated from Lathrop High School in 1963. After attending college in California and Washington, John settled down in Petersburg in 1972 to pursue a career in commercial fishing. John owned and operated many fishing boats over the course of his career including the F/V Fremont, the F/V Constitution, the F/V Theresa Marie, the F/V Prowler, the F/V Bering Prowler, and the F/V Ocean Prowler. He partnered with Bart Eaton and Jerry Kennedy to form the long-lining business Prowler, which later became the Alaska Longline Company. 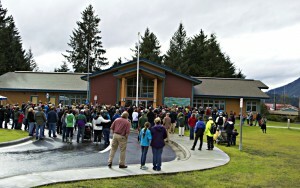 The company partnered with the Aleutian Pribilof Island Community Development Association in 2000. 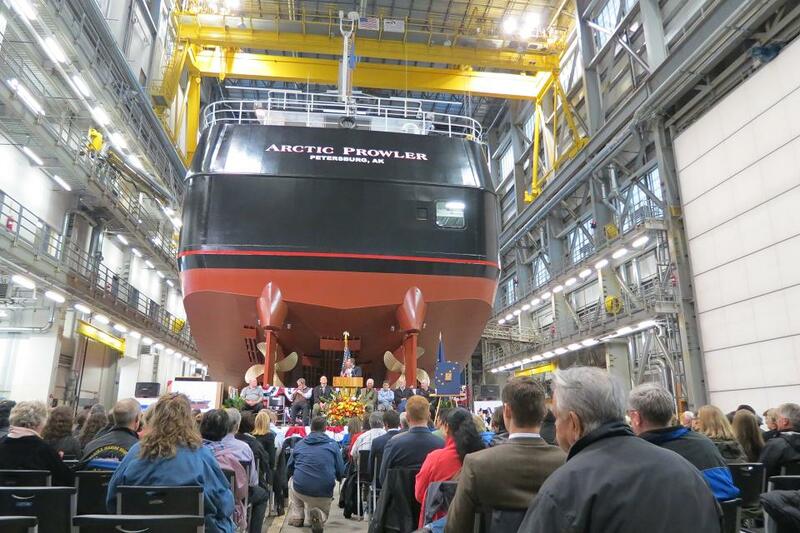 In 2009, their company continued to expand with the acquisition of two vessels and fishing rights; and in 2012, it launched construction of the F/V Arctic Prowler. John was very active in many business ventures and volunteered in both the private and public sector. 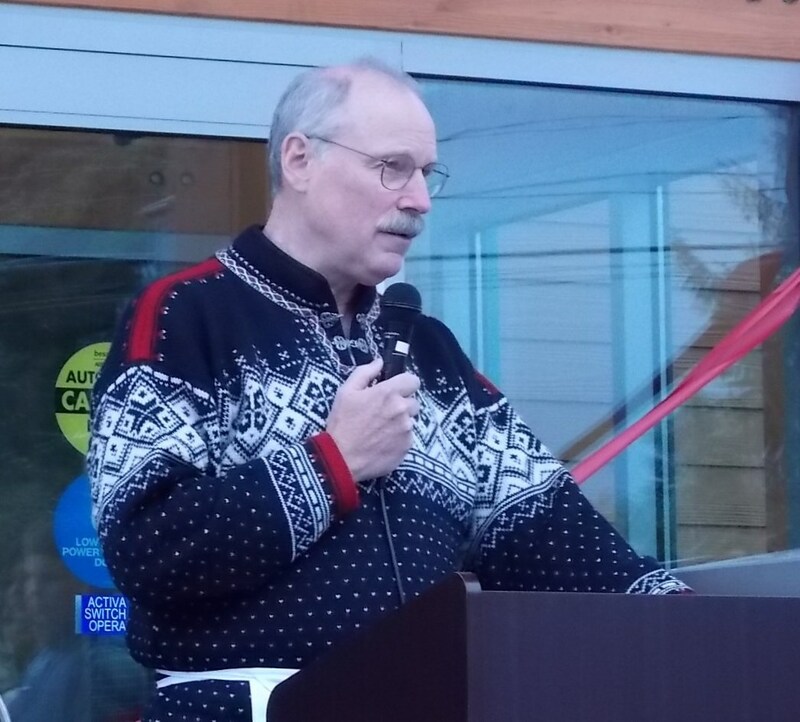 He was the director of Icicle Seafoods from 1980-1992, North Pacific Fisheries Management Council from 1983-1989, and the Alaska Industrial Development and Export Authority from 2003-2011. He was also the founder of Ultrastar Exploration and Winstar Petroleum. John was well known for his dedication to the commercial fishing industry and was highly regarded by everyone who had the pleasure of knowing this great Alaskan. John passed away on October 15, 2012 at the age of 67. Senator Stedman delivering the keynote address at the Petersburg Library Grand Opening. Photo courtesy of KFSK Radio. On September 28th, I had the honor of delivering the keynote address at the new Petersburg Library Grand Opening. I’m proud of what the community has accomplished with this impressive new facility. In 2008, the Legislature passed SB 119 creating the library construction grant program which provides a 50% matching grant from the state for communities that want to build a new library or expand an existing one. Senator Donny Olson and I carried this bill through the legislative process and when it became law, Petersburg was one of the first communities to take advantage of the new program. Petersburg was in the first round of grant recipients in FY 2011, receiving a $3.25 million grant from the state. In FY 2012, Petersburg received an additional $263,000 capital appropriation from the Legislature to further the project. Since its inception, 14 communities around the state have taken advantage of the program receiving a total of $52.5 million in library grant funding. Five of those communities are in Southeast – Petersburg, Ketchikan, Skagway, Juneau and Sitka. Currently, five additional communities, including Coffman Cove, are in the process of applying for construction grants. Finally, six additional communities are in the early stages of planning, including Craig, Haines and Thorne Bay. It’s encouraging to see so much interest in our community libraries from the towns in Southeast. Growing up in Petersburg, the library was always a focal point of the community where residents could gather and access information about the outside world. One of the fundamental pillars of a democracy resides within the literacy of its people and their ability to access information. It’s very difficult to accomplish that without public libraries. And even though we live in a more media centric age today, libraries are always adapting to keep up with the new technology. The leadership of the Energy Council and members of the Wyoming Legislature join Alaska Senator Bert Stedman, Chairman of The Energy Council (third from left), in welcoming U.S. Senator Mike Enzi of Wyoming to the Council’s 2013 Annual Meeting. 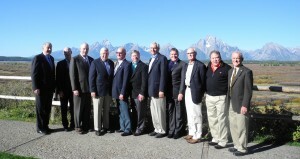 Senator Enzi (fourth from left), delivered the Keynote Address at the Annual Meeting. 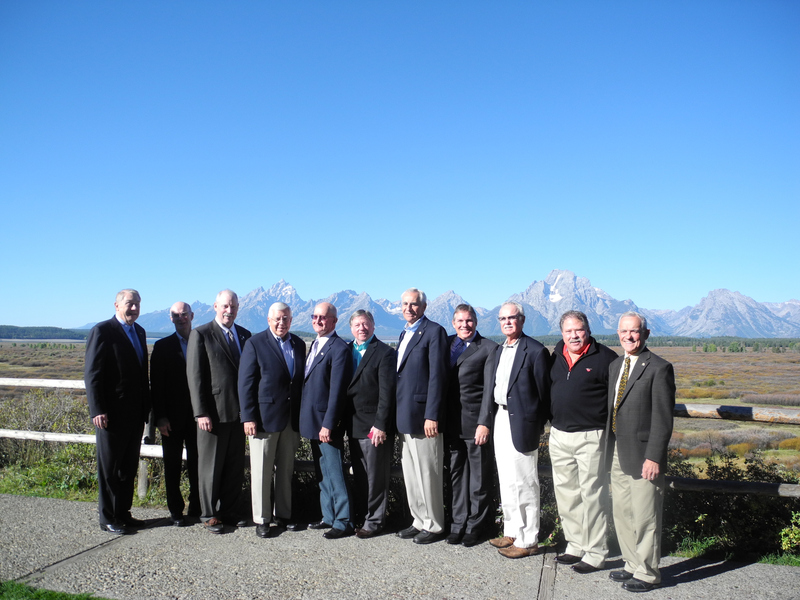 I recently traveled to Moran, Wyoming where I had the pleasure of presiding over the Energy Council’s 2013 annual meeting. Over the last year, the Energy Council and my Alaskan colleagues have afforded me an opportunity to introduce energy policy issues of importance to Alaskans to a broader North American constituency. It was my honor, as Chairman of the Energy Council, to showcase Alaskan expertise and highlight Alaskan concerns, while working with legislative energy policymakers from the United States and Canada. The Energy Council does most of its work during four quarterly meetings that rotate among member states and Canadian provinces, with a spring meeting in Washington, D.C. Participating in the Council is an important part of our continuing efforts to develop Alaska’s energy resources and foster greater collaboration between national policymakers and our state. One of the major themes of my Chairman’s Strategic Plan for the year was understanding Arctic development in a global context. Over the course of the Council’s conferences, we discussed topics like “Leadership and the Arctic – Why It Matters” and “Energy Exploration and Transportation in the Arctic,” as well as more general topics like “Pacific Energy Trade Triangles.” Among those upon whom I called to lead these discussions were Alaska Lt. Governor Mead Treadwell; the Alaska Oil and Gas Conservation Commission’s Chairman Cathy Foerster; and the University of Alaska Fairbanks Vice Chancellor for Research, Dr. Mark Myers. These presentations were helpful in developing a constituency for Arctic issues among influential state leaders in the Lower 48. Many of my Energy Council colleagues had never considered the U.S. an Arctic nation, nor Arctic issues to be their own. The Energy Council also unanimously passed, and sent to Congress, a policy statement urging the federal government to act immediately to address the threat to Alaska’s Arctic environment by properly plugging federal legacy wells and reclaiming surrounding well sites, utilizing federal revenues to do so. Just last month, the Bureau of Land Management released a Legacy Well Strategic Plan outlining priorities and actions it will take in the near-term to plug and clean up legacy wells in the National Petroleum Reserve – Alaska (NPR-A). Another area of interest to all energy producers is fossil energy trends. Consequently, it was rewarding to lead my Energy Council Executive Committee colleagues on visits to the offshore Deepwater Gulf of Mexico, the Bakken region of North Dakota, and the Powder River Basin of Wyoming. Technology is essential to energy production and to those areas which are defining energy trends in North America. For instance, the Council spent quite a bit of time learning about fracking technology and related environmental issues, especially water use. While in North Dakota’s Bakken region we visited a frack job site and came to appreciate the technology and environmental challenges involved. The third major theme from my Strategic Plan for the year, in addition to Arctic development and fossil energy trends, involved electricity and alternative energy development. Discussion of all these topics helped better inform policy makers. However, it is not up to the Council to dictate state policy. Rather, the Energy Council puts the information before legislators and it’s up to individual policy makers to apply it to each state’s particular circumstances. One of the most valuable meetings, annually, for Alaska legislators is the Council’s Federal Energy and Environmental Matters Conference. While in Washington, D.C., member legislators heard updates from the U.S. Fish and Wildlife Service’s Assistant Director for Endangered Species, the Department of Energy’s Fossil Energy Office, the Administrator of the U.S. Energy Information Administration and received a briefing from officials of the U.S. Navy on Operational Energy Initiatives. At the State and Provincial Trends Conference in North Dakota, development of the Bakken and impacts on state and local governments was a dominant topic. North Dakota, like Alaska, faces energy transportation challenges which profoundly affect the price they receive for their energy resources. Pipeline infrastructure and oil by rail were two important discussions at that meeting. Personally, one of the most interesting aspects of the Chairmanship was getting to know the Energy Minister from Canada’s energy powerhouse, Alberta. There is much in common between Alaska and Alberta in terms of resources and market challenges. It seems likely that there are possibilities for cooperative efforts that may benefit both and I will continue to cultivate that relationship. Certainly, it was an honor to chair the Energy Council on behalf of Alaska and consider all the varied perspectives that were presented over the course of the year. No doubt, the experience will prove to be essential background, as I work with fellow Alaskan legislators to shape the state’s future as an energy provider to North American and world markets. This was my last meeting as Chairman of the Energy Council, a position which alternates each year. Representative Wayne Smith of Texas was the Council’s Vice Chairman and subsequently appointed Chairman at the conclusion of the annual meeting. I will remain a member of the Energy Council’s Executive Committee and I look forward to continuing my work to promote Alaska’s interests through this important group of policy makers. Senator Bert Stedman (right) listens as Texas Representative Wayne Smith, Incoming Chairman of the Energy Council, presents him with a Chairman’s jacket in recognition of Senator Stedman’s leadership as Chairman of the Energy Council for 2012-2013. Sitka was the host city for the Southeast Conference annual meeting the week of September 16th. However, the conference fell on the same dates as the Energy Council meeting so I wasn’t able to be there. Every year I look forward to attending the Southeast Conference fall membership meeting but even though I couldn’t make it this year, my staff attended and reported back to me. I was told that it was a very productive, well attended conference and the presentations were all very useful and informative. The conferees received updates on energy and economic development projects throughout the Southeast region such as hydro, mining, timber, mariculture, fisheries and the maritime industry just to name a few. I appreciate the contributions from all the public and private sector presenters who helped to make this conference a success. For those who are not familiar with Southeast Conference, it is a nonprofit corporation that advances issues of importance to our region. Their meetings are a great way to bring communities, policymakers, and business leaders together to discuss ways to move Southeast Alaska forward. Two resolutions were approved during the conference, one supporting the Alaska Mariculture Initiative (spearheaded by the Alaska Fisheries Development Foundation) and another establishing a Regional Broadband Taskforce for Rural Southeast Alaska. 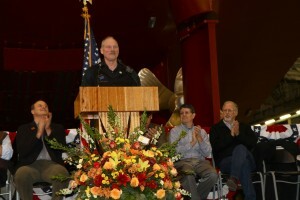 I’d like to thank the Southeast Conference staff, the board of directors, and the City and Borough of Sitka for organizing another great conference. 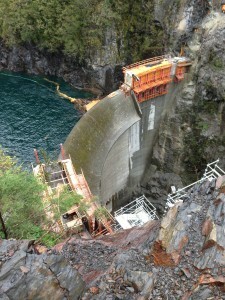 On the last day of the conference, my staff visited the Blue Lake Dam construction project. During the first week of August, I attended a gas symposium in Anchorage presented by the Legislature’s oil and gas policy consultant, PFC Energy. The symposium was organized by Senator Anna Fairclough, Chair of the Legislative Budget and Audit Committee. 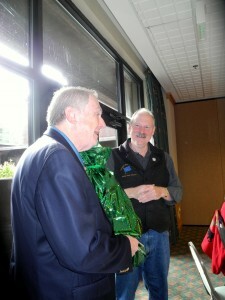 The purpose of the five day conference was to inform legislators on issues regarding marketing Alaska’s natural gas. The presentations included: global gas markets; shale gas; potential markets for Alaskan LNG (liquefied natural gas); gas strategies and portfolios of key companies; the economics and commercial structure of gas pipelines and LNG projects; and LNG shipping. I thought the information presented was very valuable for the policy makers who were present. I congratulate Senator Fairclough on a successful symposium. One of the takeaways I came home with is the fact that our window of opportunity to market Alaska’s gas in the Pacific Rim is open today but it won’t stay open for long. Russia is aggressively getting in the game, Australia is already a major player and Canada is rushing to get its gas to the coast. As a state, we need to consolidate behind one project and in my opinion, that’s the large volume LNG export project. In order to do this, the Legislature needs to come up with stable fiscal terms for gas that are fair to the industry and the citizens of the state. I look forward to working with my colleagues in the Legislature to accomplish this task.